It’s not every day you get to chat with a lifelong idol, a two-time Grammy winner, and a genuine guitar hero. As the founder and primary songwriter of Living Colour, Vernon Reid has been melting fretboards and faces all over the world for more than three decades. Having once reclaimed Rock‘n’Roll as a black artform at the apex of the hair metal craze, Living Colour’s music, with its recurring themes of racial and societal tension, is more relevant than ever. 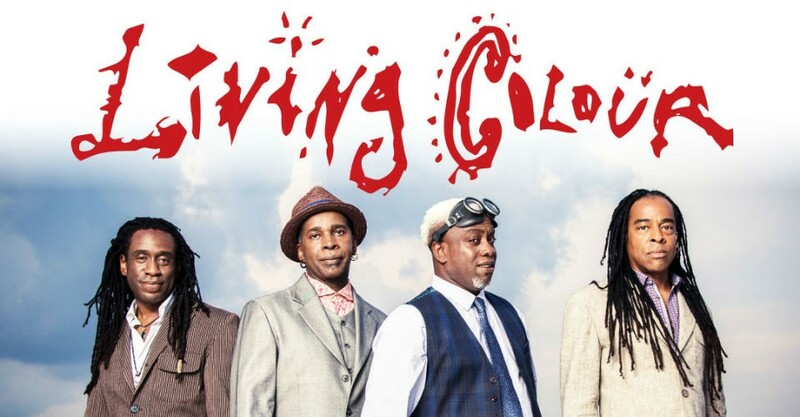 With Living Colour returning to Australia to preview their forthcoming album Shade, Vernon Reid joins us by phone ahead of their Wed 17 May performance at The Gov. Hello Vernon, are you there? I am fantastic; it is so great to get to chat here. I am a huge fan, and I’ve followed Living Colour since you hit MTV; I was about 12 or so at the time. “Oh my God!” he laughs. So first, let me thank you for your inspiring work, which has meant and continues to mean the world to me, both as a fan and a local artist, and I’m so excited that you’re coming to Adelaide. Having seen the way that Living Colour has toured and performed, both together and apart over the past few years, it seems that you guys are working as hard as ever and still growing as musicians. Tell us about your work ethic and how you stay motivated to grow as an artist and a player. “Well, I think every day is a challenge. The main thing for me is getting out of my own way. I’m always in the way of what I’m trying to say. The challenge is to get closer to just having a real expression artistically, you know, it matters, and the fact that it matters to the four of us is why the band can create an atmosphere and a vibe that is really unique unto itself. Your last album, The Chair In The Doorway,was, in my opinion, as fine an album as your band has produced. What was the process of making the new album, Shade, and how did you maintain the quality and the artistry? “It’s been a long road,” Vernon says. “We worked with Andre Betts; he’s been a friend to the band for a long time and has brought a different perspective to the work. It’s been a very rich experience working with him, and a lot of fun. “You know, it fits inside the history of the band,” he adds, “in that we’ve always had diversity and these kinds of stylistic contradictions on our albums; we have a song that has a horn section, a great trombonist on another tune. It’s got a combination of a bit of that Texas blues thing, a little bit of the New Orleans vibe, which is really, really cool. At the same time, we have Who Shot Ya? [The Notorious B.I.G. cover from last year’s teaser E.P. of the same name], and a cover of the Marvin Gaye classic, Inner City Blues on the album, and so there’s a few things that are really interesting. I’m originally from D.C, so as an American abroad it seems like a lot of the problems that America has been struggling with are reaching kind of a boiling point, and Living Colour’s music is more relevant than ever. Do you ever wish the forces of greed and oppression would just retire so you can write more love songs? “Yeah, I know, it’s weird,” Vernon says. “It’s one of the most crazy things, realising the things we did over twenty years ago are more relevant now than they were then. This record is no exception; it wasn’t even a thought in my nightmares that Donald Trump would become the President of the United States, and a lot of what we touch on is very much about income disparity, the necessity of the ability to express oneself freely, the notion of activism, and consumerism. One of the endearing things about your songs is the sincerity. You aren’t too cool to get on the soapbox, to point things out bluntly when it’s not right, to put abstract political ideas into ground-level, human terms, and not everyone can get away with that. Do you think being virtuoso musicians making complex music gives you more freedom to state things directly from the heart? “It’s sort of like music actually comes from a place… for example, I was talking about Burt Bacharach and Hal David, and Dionne Warwick to somebody and we, all the time, hear about music as a social consciousness, and music that speaks truth to power. Vernon went on to say that a great song can say anything you want it to say, and that’s the whole point. A song doesn’t have to be political; it can be, but the song has to work as a song. Living Colour perform at Governor Hindmarsh Hotel from 7.30pm on Wed 17 May with special guests. Book at OzTix on 1300 762 545 or thegov.oztix.com.au. Click HERE to purchase your tickets.